MARTHA WASHINGTON was not pleased when her husband was elected president. After his service in the Revolutionary War she had hoped to live quietly with him at Mount Vernon. She did not go to his inauguration on April 30, 1789, but in mid-May she left for New York, the temporary capital of the new nation, with her two grandchildren and seven house servants (slaves). She organized the household and devoted herself to the duties she presumed were expected of her as the president’s wife. Martha placed orders for assorted items from the mundane to the unusual as the letters below show. Clement Biddle, who had served as commissary general under Washington during the Revolutionary War, was a merchant in Philadelphia and had been appointed by President Washington to be the head of the United States Marshals. * Samuel and Ann Willing Powel were close friends of the Washingtons. 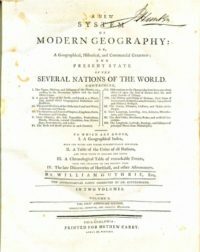 Martha Washington, “Letters to Colonel Clement Biddle, July 1790,” in Martha Washington, Item #450 and Item #451,(accessed April 27, 2017).The illustration is of the title page of a later edition of William Guthrie’s A New System of Modern Geography.